Speakers at the London Bloggers Tech Edition, from left to right: Andy Bargery (host and event organiser), John Read (Sesquey), Judith Lewis (Search Engine Chicks), Matt Russell (WebHostingBuzz) and Yiannis Pelekanos (freelance developer and guru). 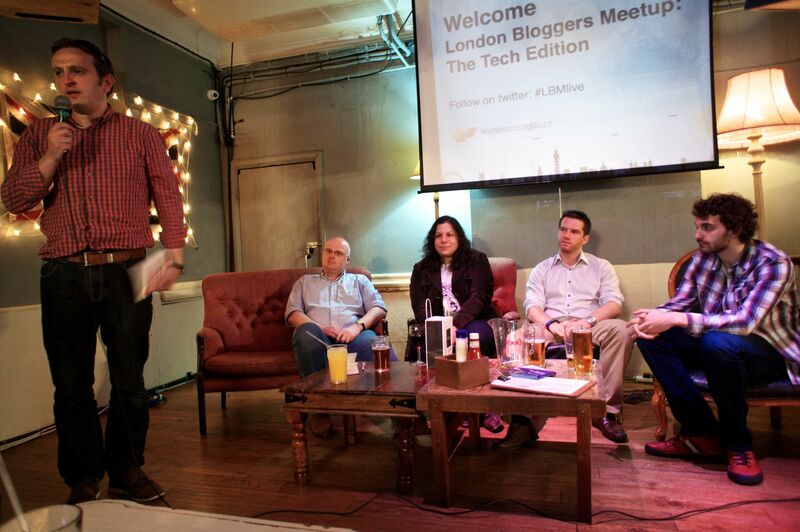 This month’s London Bloggers Meetup was all about the technology behind blogging. Over the course of a fun-filled 90 minutes, discussions and insights touched on the relative merits of various blogging platforms (WordPress, Blogger, Tumblr and Joomla); optimisation tricks for WordPress; how to find a good hosting solution; SEO (search engine optimisation) basics; plugin options, and much more. It’s not just about the presenters: I sat next to Alan Tucker, corporate photographer and blogger, and he introduced me to the Galaxy Note, History Pins, and the AMPt community. Thank you Alan! But before the talks there is much to learn from the person sitting next to you. Alan Tucker (http://www.atphoto.biz) introduced me to the wonders of the Galaxy Note camera with its lovely HD screen and easy to use photo-editing software. He pointed me in the direction of the AMPt Community where mobile photographers, artists and videographers can share work. And there was History Pin at http://www.historypin.com, a global community collaborating around history pins of old pictures to their location so that you can begin to see how an area has changed over the years. I checked out Tooting Bec Lido in South London and lo and behold a picture of the diving boards from 1906. Thank you Alan. And so to some slightly random notes from the evenings speakers. Top tips before the Q&A were make sure you update your WordPress site to the latest 3.5.2 version to ensure that it is secure. New WordPress features that are worth checking out included: multiauthor blogging; new posting format like tumblr; easy to use importing to WordPress. John also recommended the 13-14 July WordCamp for those with a WordPress site. In terms of authorship, Google gives this to the site where the article first appears. This can raise the ranking of that site and if duplicated in another site, lower its rating. Copy can be overoptimised; focus on titles and content but not so much on anchor text. Top tip: put citations next to URLS. Comments on your blog are good for people but worthless in terms of SEO. Not a lot of people know that! Yandex.com is the leading internet company in Russia, operating the most popular search engine and the most visited website. Duck Duck Go: https://duckduckgo.com/ describes itself as a search engine that does not track you and, has more instant answers and less spam/clutter. Matt gave some great advice on web hosting and also treated us to beer so a big thank you goes out to him and his company. Matt reiterated the importance of keeping WordPress up to date to avoid it being hacked. His other tips for choosing and using a hosting service were to find a provider that provided fast support. He recommended CloudFlare to load-balance your traffic and provide extra safety.Other recommendations to do the same job were Incapsula and Modsecurity. And remember to back-up your website regularly. Looking at the options for blogging, the advice was tumblr for someone who wants to keep it simple and WordPress for someone with a bit more techie know-how and patience. Joomla versus WordPress: Joomla has a good content management system but is not widely used. Very good for levels of granularity in managing multi-authoring but WordPress gets the vote because with 40 million users you can for the most part put a question into Google and someone out there will have an answer. Other topics covered included ‘domain mapping’. The favoured providers were Low Cost Names, NameCheap and Hover. Arvid Lind from Buzzkeep reckons that GoDaddy provides better long-term savings especially on ‘.coms’. Chocablog was mentioned as an example of how to do the right stuff on Facebook. This entry was posted in Business and tagged Blogging, Hosting, London Bloggers Meetup, SEO, social media by Jonathan. Bookmark the permalink. My personal recommendation for domains is Hover (hover.com) – very simple and unobtrusive management and they don’t keep trying to sell you more, unlike GoDaddy. Just my 2p! Great summary as ever Jonathan. Good to see you on Monday. Thanks for the great write up. Good to see you on Monday. Great recap, Jonathan, and thank you for the mention. Your notes make much more sense than the scribbles in my diary. I guess the secret is to keep using GD voucher codes EVERY time you renew your domains. The best place to look is: forums.digitalpoint.com/forums/vouchers.89/ – they always have a ‘sticky’ post dedicated to Godaddy.